Batch conversion of emails from NSF to MBOX. 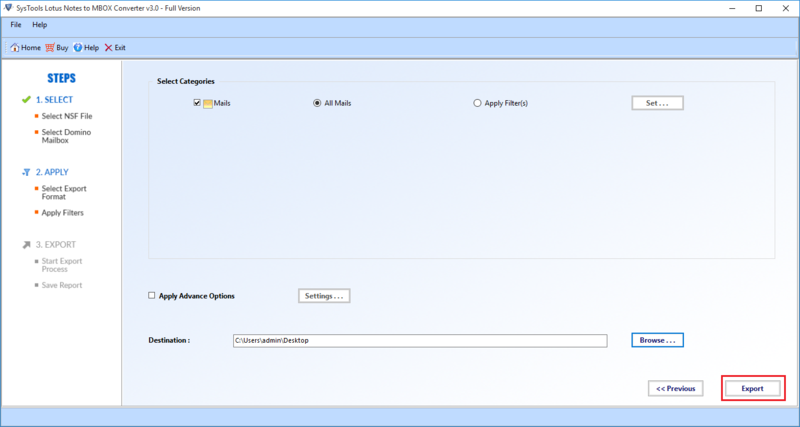 Convert Lotus Notes Domino server mailboxes to MBOX files. Also Convert Encrypted NSF mails to MBOX. Option to translate notes canonical name with outlook SMTP format. Installation of Lotus Notes components is necessary. Export Lotus Notes database of any size. Convert NSF to Thunderbird software is capable to export NSF emails to MBOX file in batch. The meta properties of mails like cc, bcc, from, to, subject will remain intact. The emails of Notes database will be saved in different MBOX. This Lotus Notes Mails to MBOX Converter helps in migrating multiple NSF Emails to Mailboxes. It has two option add file and folder option. 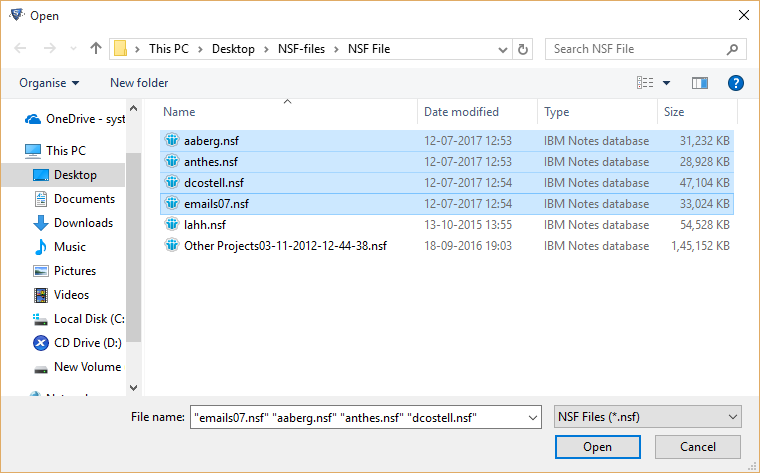 Add folder options allow you to convert NSF files in batch. This feature of tool allows the users to apply filters by setting some specific date range. It converts only the emails between the date range. Emails before and after the date range will be excluded from exporting. Lotus Notes users generally protect their mails by applying encryption on Messages. When user use this tool, it itself removes encryption from those mails and easily convert it into Thunderbird MBOX file. The folder structure of NSF database of Lotus Notes will remain same even after it convert NSF file to MBOX. 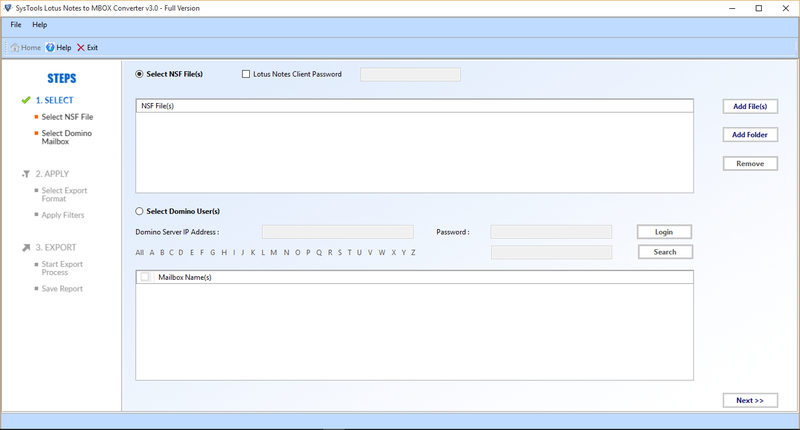 This is optional feature in this tool, user can deselect this option if they don′t want to maintain structure. By default, the tool maintains the folder structure. When the NSF to MBOX conversion process begins, a small summary report with export details like current folder name, number of folder to be converted, email count and the migrated file name. These details helps user to know the process which is occuring. Lotus Notes to MBOX converter tool can be accessed or run to convert NSF to MBOX with installation of Lotus Notes 9.0,1, 8.5, 8.0 and all below versions. Moreover, this software is compatible with Windows 2010, 2008, 2007, XP and all other versions. And the resulted MBOX files can be imported to any Email like like Thunderbird, Eudora, Entourage etc which supports MBOX files. Step 1: Download and Run Lotus Notes to MBOX converter Tool. Step 2: Browse the desired NSF file from the system for conversion. Step 3: Open selected files to load them. Step 4: Hit the Export button to start the import NSF to Thunderbird. This video shows how to convert NSF file to MBOX Files using this software. Know all the features of NSF to MBOX conversion tool through this video. I have an old version of Window and have an NSF file of Lotus Notes 7. Is this tool helpful for me to convert NSF to MBOX file? Yes, lotus Notes to MBOX converter allows all versions of Lotus Notes NSF file and also compatible with all Windows OS version. Can I Convert my old NSF File to PST format using your tool? No, Convert NSF Software only migrate NSF file to PST with the option to save NSF contacts in separate PST file. But it cannot save your files in MBOX file format. Can I convert multiple NSF files to MBOX at a time? Yes, this convert Lotus Notes NSF to MBOX software allows to add multiple NSF files stored in a folder to the tool and export these files simultaneously. Is there any NSF file size limitation for conversion? No, this tool does not impose any restriction on size of Lotus Notes database file. User can convert Lotus NSF to MBOX file without bothering about the file size. Do you provide the free trial version of this software? Yes, there is demo version of NSF file to MBOX conversion tool available which be securely downloaded and can be used to export first 25 mails of NSF file. To import number of NSF files to MBOX you have to buy the full version of Lotus Notes to MBOX converter tool. Because of the various errors occured in Lotus Notes, it always becomes hard to access my database files. Then i thought to convert Lotus NSF to MBOX which can be easily accessed in many different email clients. This Lotus notes to MBOX converter helped me lot to do so. Thanks. I had to use Lotus Notes for emailing and various other properties in my work organization. When I switched my job, I migrated all my Lotus Notes data to MBOX file which makes access those mails in many MBOX supported email clients. Thanks to Intrigua team for making it and convert NSF File to MBOX.